In this perennial bestseller, embraced by organizations and industries worldwide, globally preeminent management thinkers W. Chan Kim and Ren e Mauborgne challenge everything you thought you knew about the requirements for strategic success. 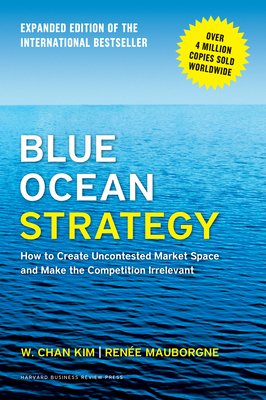 Recognized as one of the most iconic and impactful strategy books ever written, Blue Ocean Strategy, now updated with fresh content from the authors, argues that cutthroat competition results in nothing but a bloody red ocean of rivals fighting over a shrinking profit pool. Based on a study of 150 strategic moves (spanning more than 100 years across 30 industries), the authors argue that lasting success comes not from battling competitors but from creating "blue oceans"--untapped new market spaces ripe for growth. A landmark work that upends traditional thinking about strategy, this bestselling book charts a bold new path to winning the future. Consider this your guide to creating uncontested market space--and making the competition irrelevant. To learn more about the power of blue ocean strategy, visit blueoceanstrategy.com. There you'll find all the resources you need--from ideas in practice and cases from government and private industry, to teaching materials, mobile apps, real-time updates, and tips and tools to help you make your blue ocean journey a success. W. Chan Kim and Renee Mauborgne are Professors of Strategy at INSEAD and Codirectors of the INSEAD Blue Ocean Strategy Institute. They are the authors of the New York Times and #1 Wall Street Journal bestseller, BLUE OCEAN SHIFT and the international bestseller BLUE OCEAN STRATEGY, which is recognized as one of the most iconic and impactful strategy books ever written. Blue Ocean Strategy has sold over 3.6 million copies, is being published in a record-breaking 46 languages, and is a bestseller across five continents. Chan Kim and Renee Mauborgne rank in the top 5 management gurus in the world in the Thinkers50 list, a title they have held for ten straight years, and are the recipients of numerous academic and management awards around the world including the Nobels Colloquia Prize for Leadership on Business and Economic Thinking, the Carl S. Sloane Award by the Association of Management Consulting Firms, the Leadership Hall of Fame by Fast Company, and the Eldridge Haynes Prize by the Academy of International Business, among others. They are Fellows of the World Economic Forum and the founders of the Blue Ocean Global Network. For more on these authors and their new book, BLUE OCEAN SHIFT, see blueoceanstrategy.com.